Sandra Wreglesworth’s father remembered that time too. 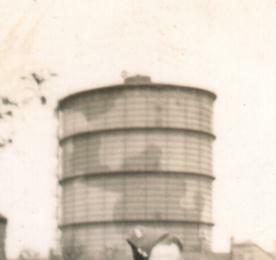 Dennis Joseph Durkin was stationed on the gasometer on the night of the Baedeker raid in April 1942, as a 17 year-old volunteer in the Home Guard. — Home Guard volunteer relives wartime raid on York, The Press, 20 April 2007. Mr Durkin’s account followed an earlier piece in the paper: ‘Luftwaffe pilot says sorry for bombing York’. — Willi Schludecker, on his visit to York 65 years later, reported in The Press. The bombed church of St Martin’s, Coney St, now serving as ‘a shrine of remembrance for all who died in the two world wars, a chapel of peace and reconciliation between nations and between men’.